"Martin said that while a decision on a merger with the SDLP or contesting elections in the North has not yet been reached, there were no circumstances under which Fianna Fáil candidates would not take their seats." FIANNA Fáil leader Mícheál Martin TD has confirmed that successful Fianna Fáil candidates standing in the North would take their seats in Westminster. Such a move would require their MPs to swear an oath of allegiance to the reigning British monarch. Deputy Martin made the remarks after he was asked about the possibility of Fianna Fáil merging with the Social Democratic and Labour Party (SDLP) to contest elections north of the border. 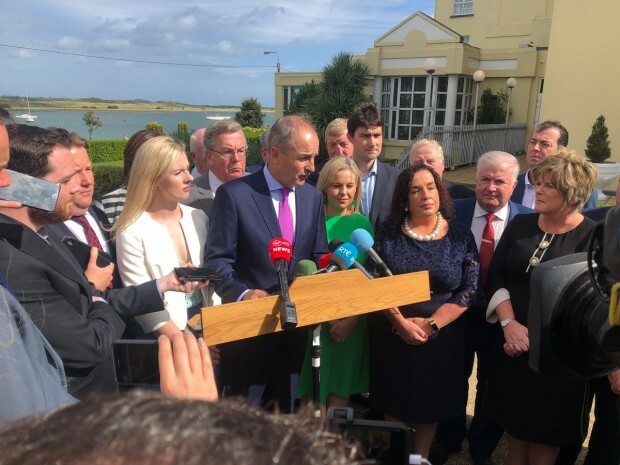 Speaking to reporters in Malahide, Martin said that while a decision on a merger with the SDLP or contesting elections in the North has not yet been reached, there were no circumstances under which Fianna Fáil candidates would not take their seats. Before taking a seat in Wesminster, successful MPs must swear either an oath of allegiance or a solemn affirmation to “be faithful and bear true allegiance to Her Majesty Queen Elizabeth, her heirs and successors”. In February, Fianna Fáil held an event to honour Constance Markievicz who 100 years previously became the first woman MP when she was elected to Westminster as the Sinn Féin MP for the St Patrick’s ward of Dublin. She refused to take her seat and instead sat in the First Dáil. Sinn Féin MPs in the North continue to stand on an abstentionist ticket. Meanwhile, a poll by LucidTalk in June 2017 showed that 87% of Sinn Féin voters backed their abstentionist stance, with only 5% opposed. When supporters were asked how they would react if Sinn Féin judged that it strategically suited the party to take seats in Westminster, more than half of their supporters (50.4%) said they would oppose such a move.